With so many people wanting to share their tunes with friends and family wherever they happen to be, it’s no wonder that small, battery-powered, Bluetooth speakers are more popular than ever. Among the many such products available today is the Tronsmart Element Force. Let’s find out if this small unit has what it takes to get the party started. 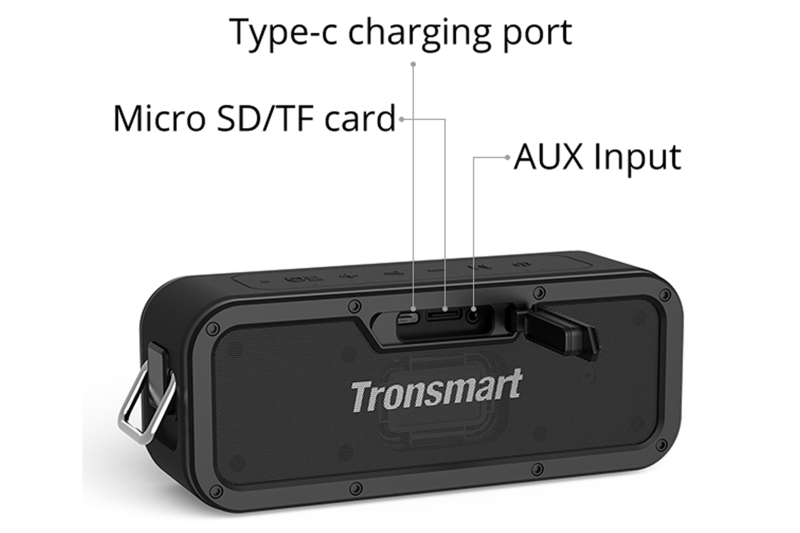 The Tronsmart Element Force is quite small, measuring 8 x 3.1 x 2.5 inches (width x height x depth) and weighing a mere 27.5 ounces (1.7 pounds). It carries an IPX7 water-resistance rating, which means you don’t need to worry about getting it wet or even submerging it in the pool or ocean (at a depth of less than a meter and for no more than 30 minutes). The specified frequency response extends from 80Hz to 18kHz (no tolerance given) with distortion rated at less than or equal to 1 percent. Sound is reproduced by two circular 2-inch active drivers firing forward and two oval-shaped passive radiators measuring 1.9 x 1.2 inches—one facing forward and the other facing backward—in a sealed enclosure. Each active driver is powered by a 20-watt amplifier. 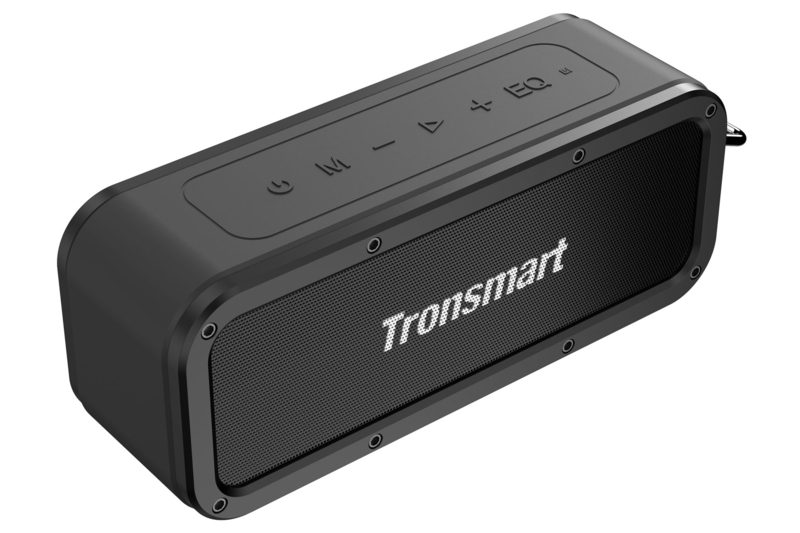 Tronsmart touts a maximum power output of 40 watts thanks to a technology called SoundPulse. According to the company website, SoundPulse uses DSP (digital signal processing) and a beefy battery—two batteries, actually—in addition to the passive radiators to boost the output and bass response of the Element Force. Aside from higher power and deeper bass, the claimed benefits of SoundPulse include eliminating a common dip in SPL (sound pressure level) in the 2- to 3kHz frequency range. Also, it is said to widen the speaker’s sonic dispersion, allowing more people to hear it without compromised sound quality. Finally, the technology claims to reduce clipping distortion when reproducing music with both high and low frequencies simultaneously. Unlike most such speakers, the Element Force offers three different EQ presets. Extra Bass does what you’d imagine, while 3D Stereo is said to “broaden the sound range and strengthen the stereo sound effect.” According to Tronsmart, the Standard preset “counteracts harmonic distortion and eliminates noise.” The default is Extra Bass (natch!). 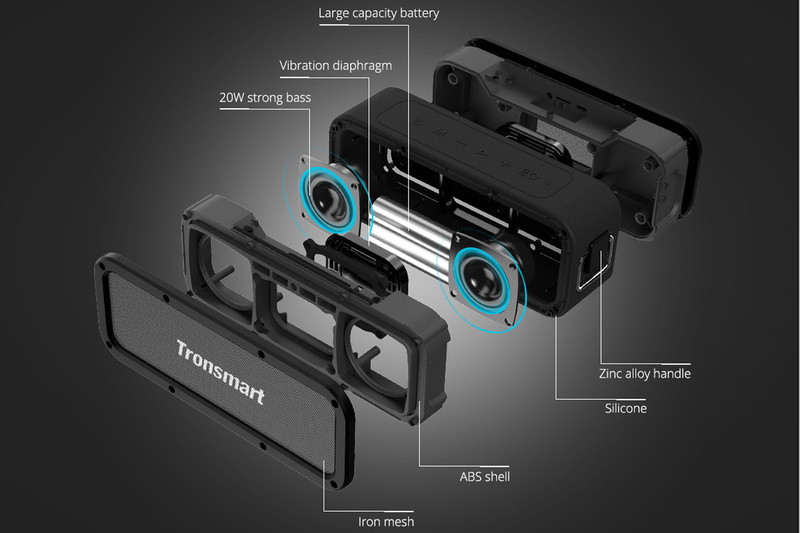 I really appreciate that you can wirelessly link two speakers to form a stereo pair, a feature that Tronsmart calls True Wireless Stereo (TWS). Of course, you can use the 3D Stereo preset with a single unit, but having two separated by some physical distance is far better. As with all such speakers, the primary audio input is Bluetooth—in this case, Bluetooth 4.2 with EDR (Enhanced Data Rate). The Element Force can pair with a Bluetooth source in the conventional manner, and it also supports NFC (Near-Field Communication), which lets you pair the speaker with an NFC-enabled device simply by touching them together. Alternatively, you can connect a 3.5mm analog-audio cable to the Aux input if there’s no Bluetooth source around. Along with the 3.5mm aux input, the Element Force provides a USB-C port for charging the batteries and a Micro SD/TF memory-card slot, which lets you play tunes directly from a compatible memory card. Supported audio formats include WAV, FLAC, APE, and MP3. All three connections are located behind a tightly sealed rubberized cover on the back, which should be kept closed when not in use for protection against exposure to liquids. The two built-in batteries, each rated at 3,300mAh, take about three hours to fully charge. After that, they provide up to 15 hours of play time at medium volume. Like many Bluetooth speakers, this one can serve as a hands-free speakerphone when paired your mobile phone. A built-in microphone picks up your voice, and the music automatically pauses during the call. The controls are located on the top surface of the Element Force. They are physical buttons beneath a flexible silicone covering that keeps water out. They include power on/off, input selection/Bluetooth disconnect/system reset, volume down/skip to previous track, play/pause/answer phone/hang up phone/redial last number, volume up/skip to next track, and EQ preset selection. Each button has a specific shape molded into the silicone, depending on its function. Unfortunately, the buttons are nearly invisible, being black on black. You can find them by feel, but I’d much prefer to be able to easily see them as well. In addition to the buttons, there are three tiny LED indicators on the top: Bluetooth status, charging status, and EQ status. That last one indicates which EQ preset is selected. Pairing the Tronsmart Element Force to my iPad went without a hitch. I listened to each selection four times: once with each of the EQ presets, and again on a JBL Xtreme 2, which I recently reviewed on TechHive. I’ll comment on that comparison shortly. I started with “Kalimankou Denkou” from the album Le Mystere des Voix Bulgares by the Bulgarian State Radio and Television Female Choir singing a cappella (no instruments). The Extra Bass EQ mode sounded surprisingly rich and full—and fairly loud with the volume control set at 50 percent. Surprisingly, the soundfield extended beyond the confines of the enclosure. By contrast, the 3D Stereo preset had much lower volume at the same level setting and a much thinner sound—more like it was coming from a small box. Also, I didn’t hear any sense of a stereo soundfield. The Standard preset was a bit louder, but still fairly thin with no stereo spread. My surprise at the wide soundfield with the Extra Bass preset led me to play “Wooden Ships” from Crosby, Stills, & Nash Greatest Hits. Sure enough, the soundfield extended beyond the small enclosure; the two solo voices at the beginning are panned hard right and left, and they did seem to be coming from those directions outside the box. The high frequencies seemed a bit strident, and the bass was slightly weak, but overall, the sound was quite good. As before, the 3D Stereo preset was much lower in volume and thinner in quality with no stereo spread at all, while the Standard preset was somewhat louder and richer, but still with no stereo soundfield. Next up was “Thunderation” from guitarist Dan Crary’s album of the same name. The ensemble includes solo acoustic guitar and rhythm section. In the Extra Bass preset, the sound was rich, and the soundfield extended well beyond the small box with clear guitar and good bass. The 3D Stereo preset was much lower in volume with weak bass and no stereo spread, while the Standard preset was louder but still with fairly weak bass. In both cases, the sound seemed to be coming entirely from the small box rather than beyond it as with the Extra Bass preset. In the world-music genre, I checked out “Radhe Radhe” from Beggars and Saints by Jai Uttal and the Pagan Love Orchestra. This track includes harmonium, synthesizers, drums, tablas, guitar, sitar, and trumpet and sax solos in addition to male and female solo vocals. The Extra Bass preset sounded full and well balanced with a wide soundstage, while the 3D Stereo and Standard presets were much softer and thinner with no stereo spread. For some rock music, I turned to “Aqualung” from The Very Best of Jethro Tull. On this track, the low midrange seemed somewhat closed in, but the soundstage extended beyond the enclosure. As I had come to expect, the 3D Stereo preset was much softer and thinner with no stereo spread, and the Standard preset was somewhat louder but still with no stereo soundfield. Moving on to classical music, I listened to the Finale of Act I from Tchaikovsky’s Swan Lake as recorded by the London Symphony Orchestra under Andre Previn. True to my previous experience, the Extra Bass mode sounded rich with well-rendered instruments, and it was plenty loud with good dynamic range. By this point, I stopped listening to the 3D Stereo and Standard presets, which were consistently less appealing than Extra Bass. From The Best of Andrea Bocelli, I played “La Voce del Silenzio” by Amelio Isolda. This track includes strings, rhythm section, percussion, and acoustic guitar to accompany Bocelli’s incredible voice in a hybrid classical/pop style. In the Extra Bass mode, the voice was beautiful and very forward, while the orchestra and rhythm section were well rendered with good dynamics. As mentioned earlier, I compared the sound of the Element Force with that of the JBL Xtreme 2, which is a similar product with an IPX7 water-resistant rating. JBL’s speaker a two-way system with a 0.8-inch tweeter, 2.75-inch woofer, and 3.5-inch passive radiator for each of two channels with a total of 40W powering all four active drivers. The specified frequency response extends from 55Hz to 20kHz, which encompasses more than the Tronsmart (80Hz to 18kHz). Also, it’s quite a bit larger and heavier than the Element Force, and it costs three times as much. Given all that, one might reasonably expect the Xtreme 2 to seriously outperform the Element Force. Amazingly, it did not. On each track I listened to, the sound of the JBL was quite close to the sound of the Tronsmart in its Extra Bass mode. Generally, the Xtreme 2 had slightly deeper bass and a smoother, drier, more “polite” sound overall. Also, the JBL was not as loud at the same volume setting, and I heard no significant stereo soundfield, but the sound was well balanced and instruments were well defined. During my testing, I inadvertently left both units powered on and inactive for more than six hours. The JBL automatically turned off during that time, but the Tronsmart did not. Granted, the Element Force has a long-lasting battery, but it should still go into standby mode after much less than six hours of inactivity. Just for grins, I compared the Element Force with the KEF LSX speakers I reviewed for TechHive. 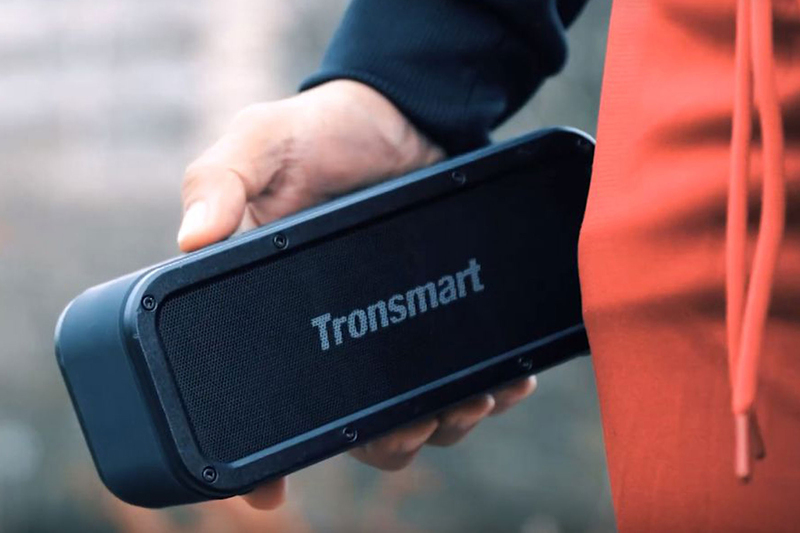 As a pair of small, high-end, powered speakers that are not battery-powered, they do not serve the same purpose as the Tronsmart. Plus, they list for $1,100, so they are not in the same price class by any means. The KEF LSX speakers sounded better, of course, with much deeper bass, warm midrange, and sparkling highs. But the tiny Tronsmart sounded surprisingly good in the comparison, and again, I was struck by its wide soundfield. Frankly, I’m astonished at how well the Tronsmart Element Force performs. In its Extra Bass EQ mode, this mighty mite dishes out rich, full sound in a wide soundfield that belies its diminutive size. The other two EQ modes sound exactly as I would expect from such a small speaker: thin, and weak with no stereo spread at all. In the Extra Bass mode, it’s even a match for the JBL Xtreme 2, which is much larger with a more sophisticated driver complement—and it’s three times the cost. Speaking of cost, $60 is amazingly low for this level of sound and build quality. In fact, it’s so low that buying two is no great financial burden, and you can wirelessly link them into a true stereo pair. When you add strong water resistance to the equation, the Element Force is a force to be reckoned with. That’s not to say it’s perfect. As I’ve described, the 3D Stereo and Standard EQ modes sound pretty bad. Also, the controls are very difficult to see, and the unit does not automatically power down after some period of inactivity. But at this price, I can easily overlook these minor shortcomings and simply enjoy the music. This mighty mite produces shockingly good sound for its size and price—but only in its Extra Bass EQ mode—and it’s water resistant to boot.